The objective of the assessment was to conduct a surveillance assessment and look for positive evidence to ensure that elements of the scope of certification and the requirements of the management standard are effectively addressed by the organisation's management system and that the system is demonstrating the ability to support the achievement of statutory, regulatory and contractual requirements and the organisations specified objectives, as applicable with regard to the scope of the management standard, and to confirm the on-going achievement and applicability of the forward strategic plan and where applicable to identify potential areas for improvement of the management system. The scope of the assessment is the documented management system with relation to the requirements of BS 25999-2:2007 and the defined assessment plan provided in terms of locations and areas of the system and organisation to be assessed. Apparently it's from a document giving feedback on the firm's business continuity strategy (as the person who sent it to me pointed out, "feedback" can also mean "grating, incomprehensible noise"). It was written by an auditor from BSI, the business standards company whose strap line is "...making excellence a habit.TM" (ellipsis and TM theirs). I particularly like that first sentence. 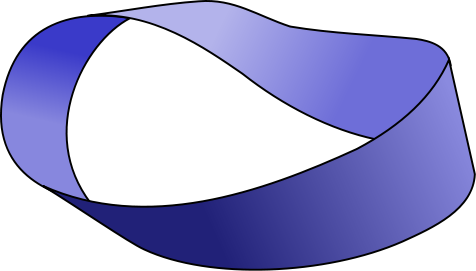 It's 100 words long and the verbal equivalent of a Möbius strip: you're led through several twists and turns only to end up back where you started, going "huh?". Trace your finger along this image and you'll see what I mean. I think what the writer was trying to say was "We looked at whether you're meeting the standards expected of you". But I suppose even consultants in the habit of excellence like to make their work sound more complex than it is.